Home > Bakar > Lifestyle > Politics > Thoughts > Modi in US - At Other End of World : Mere Hysteria or More? Modi in US - At Other End of World : Mere Hysteria or More? Narendra Modi’s US visit was definitely a trip in a very different environment as we had a PM in India who was once denied entry into a country which today was spreading out a red carpet with all its enthusiasm. There was a leader of the country who had taken the helm with unprecedented public support and is believed to be an able decision maker in general. And when such a leader of largest democracy of the world decides to engage with the oldest democracy of the world, hysteria is the least one could expect. And all this happening with a speech in United Nations General Assembly simply provided the media with an added fluff to make hay. So now that today, PM Modi returns home after week-long fanfare, series of meetings and stream of speeches, here is a gist of key highlights of this trip. The trip did not occur without enough preparations and strategic placements by the Indian administration. Generally, the US President avoids bilateral summit meetings around the UN meets as this is time where heads from many countries are in the country and meeting one may embarrass others. However, such was assertion of Indian PM that this time US had to accept setting aside this protocol and a Washington trip was added to the New York visit for UNGA. And this too was done after the public relation machinery of the government ensured that the world knows that the PM received multiple invitations from various levels of US Government to show the domestic audience that this PM was not too keen for a US Visa. Moreover, the government ensured that the visit came after PM engaged the neighborhood of SAARC and met leaders from some countries not too friendly with US. All this was to show that India was now not the same country, which once was ready to subvert its rights to the most powerful country of the world. As a build up to the visit, Modi launched a hyped-up Make in India campaign aimed at attracting investment in manufacturing sector. May not be intended that way but the visit happened immediately after two landmark events – India successfully putting a satellite in Mars orbit and Standard & Poors escalating India’s economic outlook to stable. These two must definitely have armed our PM with more confidence in asserting Indian influence. On reaching the land which once un-welcomed him, Modi clearly showed the world that he was a very different leader with a very different approach to diplomacy. While he had a set of high-level interactions with US leaders including their President, he made no hesitation in underlining that the relation between India and US could not be seen with lens limited to that of New Delhi and Washington. These relations were more about how the people in both countries thought of each other and hence he left no stone unturned to take his message to the American Community both of Indian origin and otherwise. On his very first day, coming down to the roads of New York to honor the effort of those thousands who gathered for his reception won for him many hearts. His speech at the Central Park was aimed at interacting with those of US origins and was engrossing enough for over 60,000 American youth to listen to Indian PM with all their attention. The purpose of engaging with general population was taken at next level at the Madison Square Garden where an audience of 20,000 had to be selected by a lottery. It was no less than a festival out there in US for the Indian origin diaspora and the west definitely took note of a leader from India in that way for the first time. The basic context of the trip was to attend the United Nations General Assembly meet and to speak to world dignitaries. We all definitely missed his commonly expected flair of speech as he was confined to set speech because of high-stakes and world-wide implications. He did seem to struggle with some vocabulary for which probably some writer from Ministry of External Affairs would already have been reprimanded. However what is important to look at the content of the speech and there was no part of it that could disappoint us as Indian. The speech stuck an awesome balance between regional issues and global concerns. While he took the opportunity to snub Pakistan for raking up Kashmir issue on world forum, he ensured that his speech did not sound one-country centric. The geographic coverage of the speech which touched on a gamut of issues faced by the world was definitely a wide-horizoned set of words of a truly global leader. The first meeting over dinner turned into a quasi-official affair in backdrop of the fact that NaMo was not eating and Mrs. Obama decided to give it a miss. There were officials on both sides closeted over a meal table and what comes out of it is a vision document which inherently supports India’s stand for requirement of restructuring of UN Security Council. This was followed by a joint op-ed by the top leaders of the largest and oldest democracies of the world which itself was something of an unexpected outcome. The joint commitment to moving ahead together – Chalein Saath Saath – is definitely encouraging to our future ties. At the end of delegation level official meeting next day, both leaders came out to jointly talk to media and their bonhomie during the entire event is something that we have not seen between many world leaders for quite long. This went onto the two leaders visiting King Martin Luther’s Memorial together and the parting handshake does show the ease they developed during the two meets. We do have heard that there are multiple agreements signed there details of which are still flowing in. While, I am not sure if the trip deserved such hype or did we reap benefits worth the clamor, but the excitement created by the trip is definitely something to watch out for. If nothing else, this trip would most surely have brought the Indian community in US tad closer to their homeland and they would be more interested in what goes on in their country. 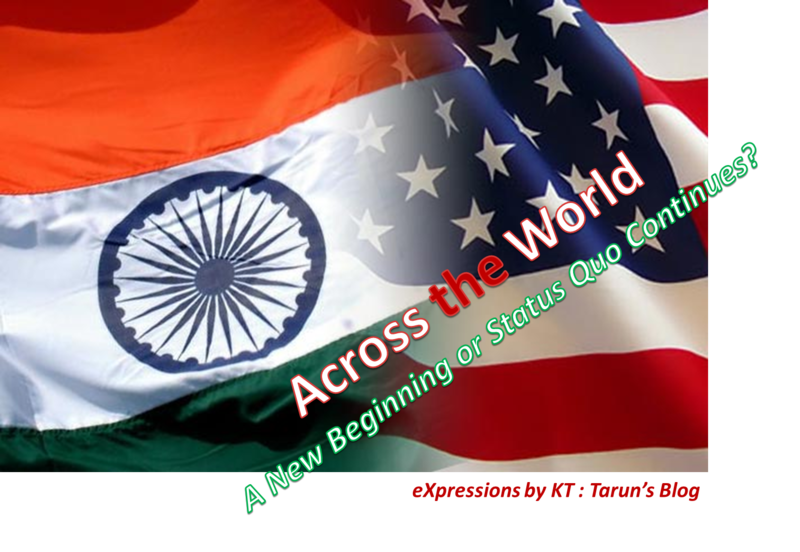 That itself is an achievement in right direction to unite all Indians where home or across the other end of the world. This was definitely accompanied a statement to the world that we now have an assertive leader at the top of the country who knows the intricacies of marketing and projections and is aiming at showcasing a very different image of Brand India to the world. Let’s just hope this is just one of the many such engagements and we finally achieve the goals that we have set for ourselves.